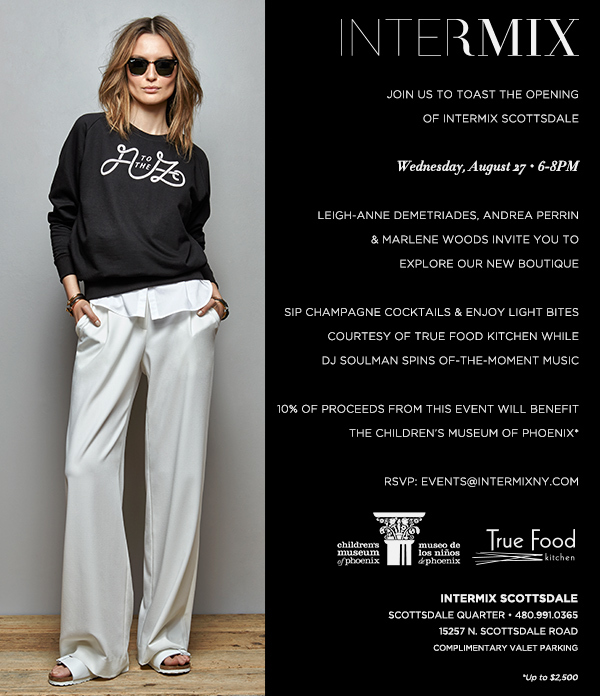 Celebrate the grand opening of INTERMIX Scottsdale with champagne cocktails and lite bites from True Food Kitchen to the beats of DJ Soulman at the retailer’s new Scottsdale Quarter boutique Wednesday, Aug. 27 from 6 p.m. to 8 p.m.
INTERMIX is known for its highly curated selection of apparel and accessories from both emerging and established designers, like Rag & Bone, Herve Leger, Diane von Furstenberg, Valentino and more. As the international retailer’s first Arizona location, the décor of the new 1,500 square-foot boutique features a neutral color palette that’s inspired by the desert landscape. White-washed oak wood paneling and rich brown-stained wood floors support the luxurious custom rugs, leather tabletops, natural suede upholstery, and fitting room seats made of Italian leather. INTERMIX is celebrating Scottsdale as its 39th location with a custom, limited edition Scottsdale sweatshirt in partnership with ELEVENPARIS and typographical designer and artist, Pieter Ceizer. At the grand opening event, 10 percent of all proceeds will benefit The Children’s Museum of Phoenix. Intermix Promo Code: Extra 15% Off!